Looking at ownership levels, I am shocked that McKenzie Milton is available in 40% of leagues. The Knights field general ranks twentieth among quarterbacks with 1,997 yards passing, 254 yards rushing and 21 total touchdowns. In five games, he has eclipsed 30 fantasy points scored and less than 20 only once. The Mustangs pass defense ranks 122nd in the nation, surrendering over 275 yards per game, and Las Vegas projects another AAC shootout. At press time, Milton is only inserted into 39% of starting lineups. If the UCF star is on the waiver wire or the bench, insert the sophomore signal caller into your lineups immediately. The Warhawks are one of the worst defensive units in the FBS, ranking 124th in Total Defense while allowing 37 points and 505 yards per game. Taylor Lamb is the 31st most productive fantasy quarterback, averaging over 24 points per game. In five of eight contests, the senior has scored more than 20 points and should easily record his sixth 20-point performance against Louisiana Monroe. If you need assistance, Lamb is a worthy starter on fantasy rosters. Unfortunately, Ralph Webb has not matched expectations as a senior for fantasy managers. He recorded back-to-back 1,000-yard campaigns as a sophomore and junior, but has only 439 yards in eight games this season. Webb has earned 20 carries in three games and surpassed 100 yards once. Luckily, the Commodores welcome the Hilltoppers into town. Western Kentucky surrenders over 185 yards per game on the ground and 16 rushing touchdowns. 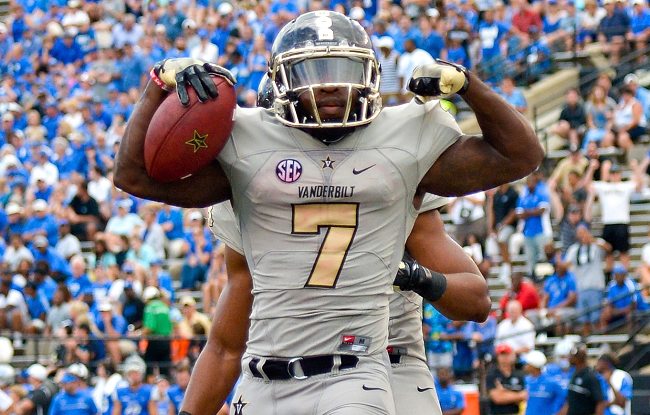 Vanderbilt is a 10-point favorite at home and likely has the lead in the fourth quarter. Do not shy away from inserting Webb into fantasy lineups. Utah coach Kyle Whittingham moans about his team’s lack of a consistent running game, and the Utes host the perfect opponent to jump-start their ground attack. The Bruins employ the poorest front seven in the nation: Opponents have pulverized UCLA for 2,457 rushing yards (307 per game) and 23 touchdowns. Moss leads Utah with 587 rushing yards and averages 5.1 YPA. There is no way that the 5-foot-10, 210-pound sophomore does not net 25 touches and easily surpasses the century mark and scores once. The Bulldogs employ a nasty backfield duo with Jared Craft and Boston Scott; Coach Skip Holtz considers the two ball carriers interchangeable. In three of the last four outings, Scott has exceeded 16 fantasy points, rushing for 317 yards and scoring five times. Louisiana Tech has a 4-4 record and welcome North Texas into Ruston, LA. The Mean Green are very kind to opponents, permitting 37.9 points per game. Coach Holtz will continue to rotate backs and give Scott double-digit touches again. The matchup invites fantasy owners to put Scott in a flex position. The senior is in the mist of his best season on campus: He has snatched a career-high 32 catches for 477 yards and four touchdowns. At 6-foot-5 and 207 pounds, Valdes-Scantling presents a major challenge for the Huskies secondary. Last week, Missouri’s receivers used their size and speed to overwhelm UConn, and the Bulls will scheme their home run hitter into single coverage deep down the field. Valdes-Scantling posts his second straight 100-yard outing and reaches the end zone. When the season kicked off, college fantasy enthusiasts (like myself) expected Demetris Robertson to lead the Golden Bears in receiving. Regrettably, the sophomore speedster suffered a season-ending injury early in the campaign. Without Robertson, Vic Wharton, III has ascended to the top of the pecking order in the aerial assault for Coach Justin Wilcox. The Beavers have been beaten for 22 touchdown passes and over 250 yards per game. Wharton provides a great option for managers who need a receiver or flex option this week.